TOMS Shoes of Santa Monica, California has taken a page from MAC Cosmetics and created a strikingly straightforward cause-related marketing promotion. When you buy a pair of their shoes, another pair is given to a kid who needs them. The shoes are Blake Mycoskie’s more fashionable take on the traditional Argentine slip-on shoe called an alpargatas. Mycoskie, who didn’t have any prior fashion or shoe industry experience before starting TOMS, found alpergatas on a trip to Argentina. He also found a lot of Argentine kids running around shoeless. He loved the shoes and put the two notions together. “I said, I’m going to start a shoe company, and for every pair I sell, I’m going to give one pair to a kid in need,” Mycoskie told Time Magazine. The shoes are modestly priced and come in a range of materials and colors. TOMS and Mycoskie get tons of publicity. The shoes are sold in traditional retail outlets in the United States, Canada, Italy, Japan, and Korea, and online. TOMS released its first line of shoes in June 2007 and Mycoskie says the company is already profitable, which is surprising considering the company has higher costs that come from having to manufacture two pairs of shoes for each pair sold. The lesson for cause marketers is clear; don't over-complicate your campaigns. If the customer can’t easily and quickly parse out the offer, then you’ve almost certainly shortchanged your campaign. The simplicity of the offer from TOMS and MAC Cosmetics creates word of mouth that is remarkable. That is, worthy to be remarked upon. That’s why the publicity has been so good. Mycoskie is also taking the next step in creating a cult brand by taking along customers and others with him when he does what he calls “shoe drops.” Hundreds of people have signed on to go with him to South America and elsewhere to give away the shoes. And they’re doing it at their own expense. I have only one small suggestion for Mycoskie and his team. Since TOMS is basically built for word of mouth marketing, there are a handful of things they could do to their website to enable better word of mouth. 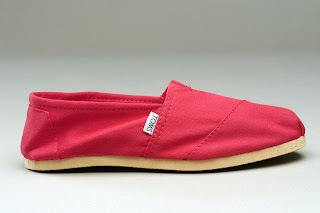 A big thanks to Lisa Warnock, a member of the Cause-Related Marketing Googlegroup, for bringing TOMS to my attention. So what would your recommendations for TOMS' website be? Thank you for writing about TOMS in your blog! We would like to send you a gift to show our appreciation. Please e-mail me your mailing address by this Friday! Also, we’d like to invite you to join our online community on Facebook at TOMS Shoes: Shoes for Tomorrow.